I think it's safe to say that the majority of people that go down to Comerica Park for a game or Ford Field to catch the Lions either grab dinner at Cheli's, Hockeytown, or in Greektown before they ride the People Mover over. Many of them are not aware of all of the awesome restaurants there are in the area. 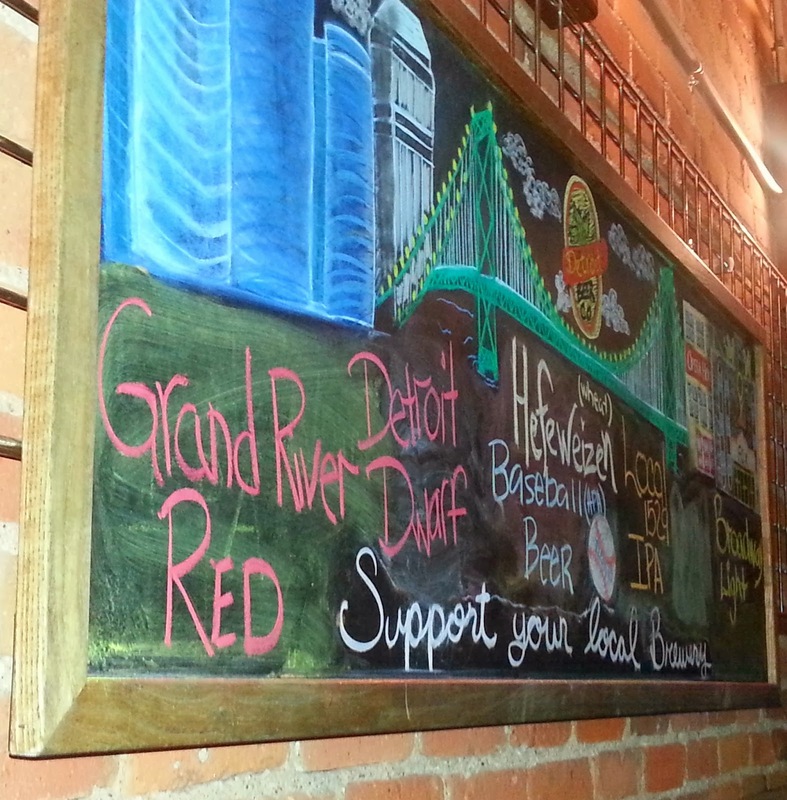 One such place is The Detroit Beer Co. Although this restaurant is not directly across the street from the ball park, it's just a short walk away and well worth it. 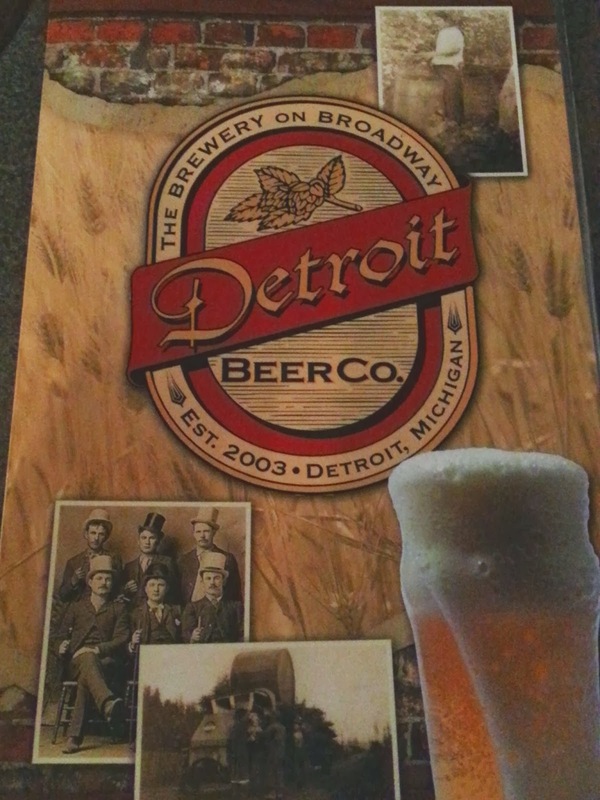 Detroit Beer Co. was at one time (and possibly still is) affiliated with Rochester Mills and Royal Oak Brewery. 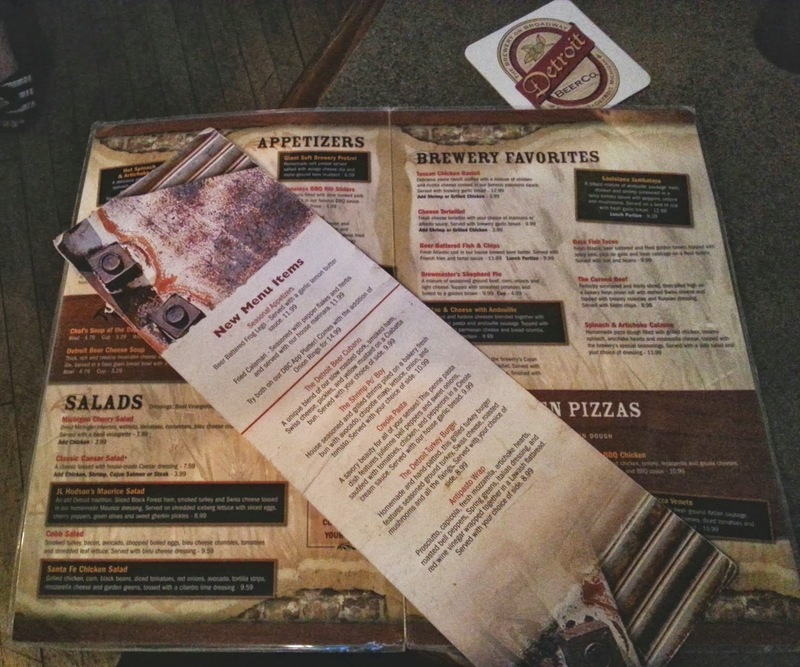 So, if you are familiar with either of those two breweries and food joints, this is along the same lines. 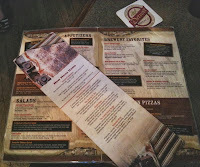 They have a few dozen beers with a variety of colors and flavors that they brew in house. Unfortunately on my latest visit I didn't try out any beers, which probably seems pretty outlandish since it's a brewery. Instead, Sadie and I were there for an early lunch. And despite the fact that we didn't drink any brews, we were more than happy with our trip. On this particular visit I had the Antipasto Wrap with the housemade chips and Sadie had the Cajun Salmon & Avocado Sandwich with waffle fries. I must admit, I was pretty jealous of her waffle fries and had to steal a few, although the chip are pretty great too. I also must add that we did take pictures of our food, but it was about half way through our meal when we decided to do a review. So, needless to say, the pictures did not do the food justice and didn't look very appetizing at all for that matter. With that being said, for just being "sandwiches" both of these selection were awesome. My wrap contained pretty much everything you would get on an antipasto salad, but it all seemed extremely fresh, especially the mozzarella. And, I don't like fish at all, but even Sadie's salmon looked great. On a prior visit I tried the Tuscan Chicken Ravioli, which was pretty amazing. I know, you probably don't think about pasta when you are at a bar, but theirs is awesome and the cheesy flat bread that covers half of your dish makes it even better. Overall, although Detroit Beer Co. is a brewery it's also a great place to grab a meal. Whether you are going for lunch or for a nice dinner, there are plenty of selections on the menu, ranging from burgers to pasta and from pizza to Shepherd's Pie. The prices are pretty decent (ranging from about $8 to $13 for bigger meals) and the portions for those prices are on par if not plentiful. This is also a great place to go if you aren't quite sure what you want to eat that day, as their menu has quite a variety. 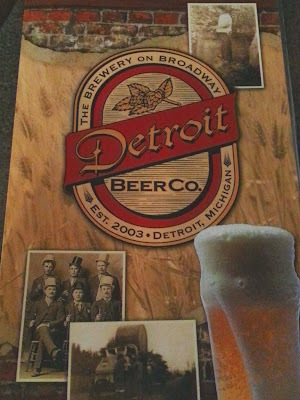 So next time you're down at a game or want to try a new place for dinner, check out Detroit Beer Co. It's located at 1529 Broadway in Detroit, just a few minutes from all of your sporting events and from the Grand Circus Park People Mover stop. And we promise we will go back and actually try the beers very soon!